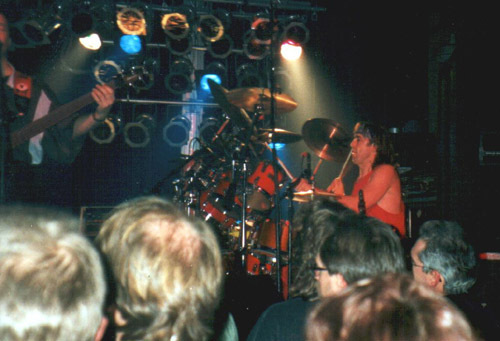 On 20 January 1992 a concert of Procol was announced for Mannheim, Rosengarten, a nice hall, where Procol played in 1977 and Gary in 1991 and 1993 with Rock Meets Classic. 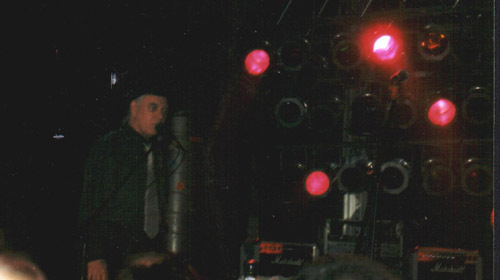 The Prodigal-Stranger tour was as badly promoted [but see below!] as the album was. So it was no wonder, that the concert had to take place in the "Alte Feuerwache": an old hall, where vehicles of the fire-brigade stood in former years. There were only about 200 spectators. I have no set-list, but I can remember that PH started with Conquistador and the last encore was Repent Walpurgis. 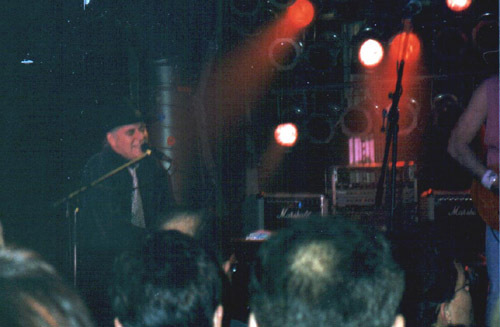 The musicians were the same as at the "Well's on Fire Tour", except the man on bass, Dave Bronze. I'm not sure, if the band had much fun in this hall in front of such a small audience. But they played well, a good concert, all great Procol songs were played. 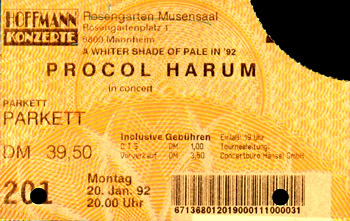 On the tickets there was not Prodigal Stranger - Tour but A Whiter Shade of Pale in 92. The "Well's on fire - Tour" was much better promoted, thanks to BtP. 'As a leading social historian (IMO of course) I object to myths being peddled unsicced. Just because G. Brooker says something doesn't make it true. The above page says the Prodigal Stranger album was badly promoted. OK, in the UK it was not brought out for a year, but US shops were full of (unsold) copies – it was even widely available on vinyl and cassette in case the target demographic still struggled with the idea of those little shiny things. There was plenty of radio promotion etc including that pseudo-interview disc and to get on Carson, Letterman etc. after years away and in a climate where your music is deemed terminally un-hip can only have been done with earnest promotion. Those are top watched shows.